Several days ago, I saw the Swarovski News that the crystal brand had released an ’app’ in the Apple iTunes store. 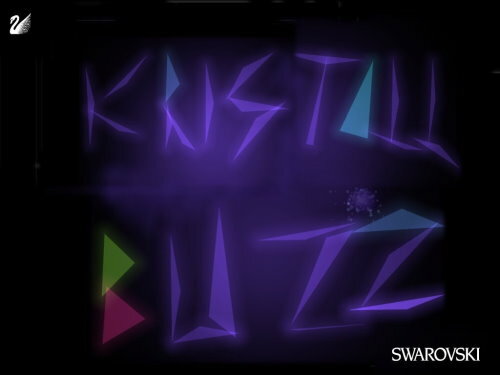 This free app, for the iPod Touch, iPhone, and iPad, is called Swarovski Refract. 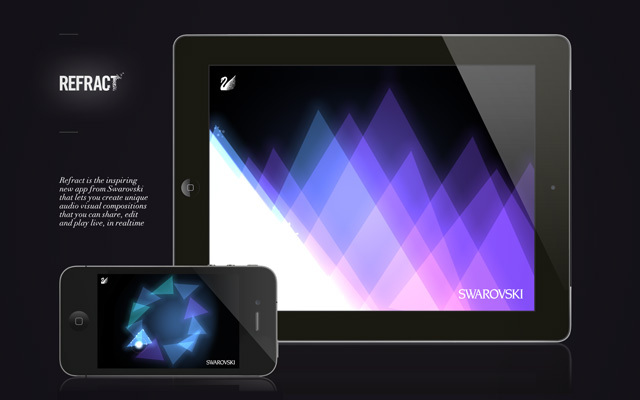 The Swarovski Refract App allows users to play with triangular shapes, lights, colors, and sounds. In short, a player generates a triangle with sparkling tips then moves this shape around the screen to change the colors and sounds it generates. The triangle shapes and sizes can also be modified. During the play, sounds will be heard based on the various combinations of triangle order, size, and color to produce a brief tune. Swarovski Refract comes with about 10 predefined compositions ranging in length from 1 to 3 minutes. There is one that is 22+ minutes long. The Swan in the upper left corner acts like a home button, bringing up the main menu and options. There are three features in the app that are initially locked, and can be unlocked by completing simple tasks. One feature is Duck J, which adds some funky rhythms and percussion beats to the sounds. Another feature is the Nirvana Ring Feature, which adds some extra sparkle on the screen. The remaining feature is Chaton feature, which adds some unique shape-echoing shadowing on the screen. Of course, the crystal brand wants to promote Swarovski Refract via composition-sharing. Features in the app allow sharing via email, Facebook, and entering it into a competition. The Swarovski Refract competition runs thru October 14, and the grand prize winner receives an iPad2 with a limited edition Swarovski crystal embellished iPad2 case. A panel of 5 judges will select the top 10 entries for posting to Facebook, where Facebook fans will then vote on their favorite crystalline composition. I found another app in the iTune store that was an interesting play on touch and lights. Called ‘Uzu’, it costs 99 cents to $1.99 depending on whether a user wants it for an iPod or iPad. In it, a player touches the screen with 1 to 10 fingers, moving them around to generate some very busy action: spirals, confetti, falling stars, and more, but without the sound or music. A demo of Uzu can be found on YouTube. Swarovski fanatics will find the Swarovski Refract App entertaining. And with some patience, create a remarkable composition worth sharing, and perhaps winning! Best of luck to anyone entering the Swarovski Refract competition!